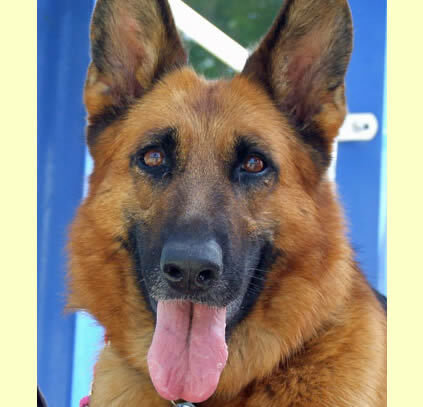 I adopted Nina, the dog you rescued in Hong Kong, at the GSROC adoption event held on Sept. 29, 2007 in Yorba Linda, CA. I’m 55 years old, single, and lived alone until I got Nina. I was alone in this world, and had been since my Mother and Father passed away 5 1/2 years ago. In many ways, I was as needy of rescue as Nina was while she was living in the street, and she was fortunate enough to be saved. Luckily for me, your efforts led to her being able to save me. In less than 2 months, she’s gone from being my new dog, to the center of my universe, and my love for her grows deeper every day. She’s as perfectly behaved as anyone could hope for, always wants to know where I am, what I’m doing, and if I’m not in sight, she’ll come looking for me. I could go on and on about what a wonderful dog she is, but the real point of this letter is to thank you for what you did, for her, and indirectly, for me. I thank you for your work in rescuing these dogs in need. Not only do you find good homes for the dogs you save, but more often than you may know, the dog you place may be the catalyst for turning a house into a home, and give a man a new reason to care again.